Chipper Jones, one of the most nationally recognized professional athletes of all time, is a former MLB third baseman who played for 19 seasons with the Atlanta Braves. Although initially a shortstop, he spent most of his career as the starting third baseman for the Braves. In 2002 and 2003, Jones played left field before returning to third base in 2004. Jones said in March 2012 he would retire at the end of 2012. Jones was an eight-time All-Star selection before retiring after last season. Many baseball writers anticipate Jones will be inducted into the Baseball Hall of Fame as soon as he becomes eligible. 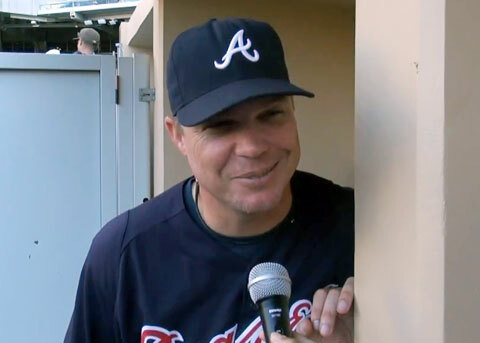 On June 28, 2013, Jones’ number 10 will be retired by the Braves and he will be inducted into the team’s Hall of Fame. PFP Sports and Celebrity Talent Agency is a booking agent for motivational sports speakers and celebrities. If you would like to book baseball speakers or Atlanta Braves players like Chipper Jones for a speaking engagement, autograph signing, guest appearance, product endorsement, celebrity golf tournament, charity fundraiser or special corporate event, you can contact Chipper Jones’s agent for appearance and speaker fees or call 1.800.966.1380.